Wandering Albatross - 8 Things we bet you didn't know! Wandering Albatross – 8 Things we bet you didn’t know! The Wandering Albatross is one of the giants of the avian world. A truly majestic bird to witness in flight, a sighting can certainly be an incredible part of your Antarctic expedition cruise. Should you be lucky to see a nesting site, you will be one of the privileged few! These incredible animals can fly on fishing trips for 14 – 20 days and use as much energy as sitting on a nest, now, that is impressive! Here are some more facts on this fantastic Antarctic local. 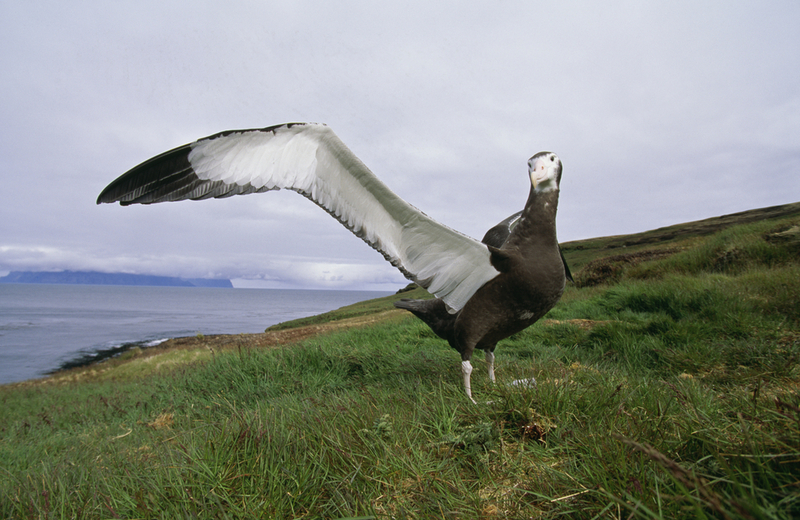 1) The Wandering Albatross can have a wingspan of up to 3.5m which is the largest of any bird. They also can measure over 1m in length making it one of the largest birds in the world. 2) Albatrosses pairs generally breed every two years producing one chick, and mate for life. December – January is when eggs are laid, and hatching usually occurs at around 11 weeks after the eggs are laid. Juvenile birds can weigh up to twelve kilograms! This can lead to a few issues when learning to fly, and their clumsy attempts have been captured on a few amusing YouTube videos. 3) Wandering Albatrosses can cover huge distances of many thousand kilometres on a feeding journey. They have been known to cover 1000km for breakfast! One bird was tracked around Antarctica for a flight of 46 days. 950km per day and an average speed of over 40 kilometres per hour! 4) Albatrosses don’t actually “flap” their wings. They have a locking mechanism in their wing which allows it to hold its position for the duration of long flights. When flying they use a technique which is known as “dynamic soaring” that allow them to use the winds energy to sustain their long distance journeys around the Antarctic. 5) The estimated world population is 26,000 birds – Their habitat is under threat on some sub Antarctic islands due to rodent infestations – although in South Georgia there has been some recent success (link) in eradicating rats from the Island. Long line fishing is also an ongoing threat to the species. 6) In Maritime lore, Albatrosses carry the soul of dead sailors, and for an Albatross to die on-board a ship it was deemed as very bad luck (for the ship, not just the bird!). 7) Wandering Albatrosses are best seen on Prion Island, a 2.4km long island off the coast of South Georgia. Some Antarctic cruises actually stop here either early in the season (October) or Late (March onwards). This is due to the sensitivity of the Islands. Very limited visitors (around 200) are allowed here each year, so if Albatrosses are your thing – then it’s a must see. Over the past few years Prion Island has had some elevated boardwalks installed so that visitors do not interfere with the breeding and nesting birds. 8) When breeding, Wandering Albatrosses take part in a ritual known as “Sky calling” where the birds spread their immense wings and vocalise upwards, the dance can last many minutes and can be done each time they breed. A journey to the Antarctic Peninsula isn’t complete without seeing at least one of these majestic birds tailing in the wake of your ship, on the lookout for fish in the churned up waters. 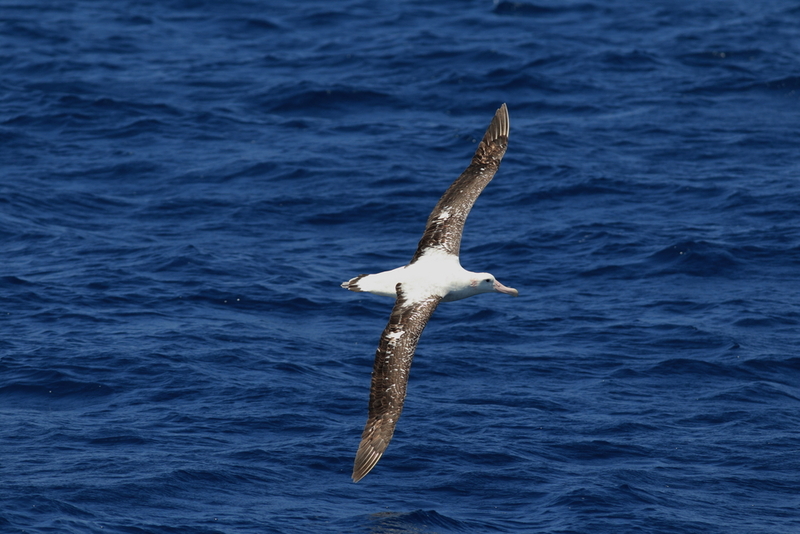 Albatrosses are solitary animals when in flight and we find the best place to spot them is generally at the stern of your ship, whilst crossing the Drake Passage. Thanks to Santiago de la Vega for helping to compile this information. Santiago was our resident Ornithologist on-board Chimu Adventures “Shackleton Discovery” and “PinKtarctica” voyages aboard the Sea Adventurer. Argentinean by birth, Santiago holds a master’s degree in Biology from the University of Buenos Aires and has been guiding bird trips in the Antarctic as well as Argentina and Chile for the past sixteen years. Want to go on an Antarctic cruise yourself and spot the Wandering Albatrosses? Then stop dreaming, put down that laptop, and let us guide you to one of the most mesmerizing places on earth!